It seems that this is a season in which many of us are experiencing storms of many types and magnitudes. But can we see God or His operation in the midst of these storms? What do we see…failure or success; victory of defeat? This is important because our victory will depend upon the answer. What are you going through; family/marital issues, financial distress, health problems, spiritual questions or doubt? Regardless of what it may be and the degree of difficulty you may be facing at this moment…you/we absolutely must be able to see God in the storm! Storms have a way of calling our attention to it. Be it a thunderstorm or a financial storm, we tend to look at the strength of the storm rather than the strength of God to see us through it. 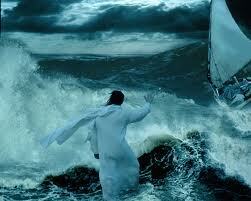 Unfortunately, many Christians have believed that serving God will eliminate our storms. However, that line of thinking only serve to create a foundation of sand that will begin to erode as the waves of life start to beat upon it. My friend, Jesus came to give us peace. Yes, there will be many things that we will go through and some of it will be difficult but that is no reason to give over to it or give up. We absolutely must find strength in the fact that regardless of the circumstance, the Lord has already gained and given us the victory! We have cowered to life’s hardships for too long—it is time to stand still and see the salvation of the Lord—Exodus 14:13 (KJV). I believe, the standing still part does not mean inactivity; but full trust and faith in the fact that our God is above all and has already given us the victory over all that would ever come against us in life! We must move in faith in the midst of our storms…not in fear. Our faith has to be in the victory that God has given us. Fear is trusting that we will lose, that things will not work for us. Fear is believing that good will not come to us and we will fail—it really is calling God a liar! The truth is that God has given us victory of the devil and He wants us to walk in full confidence of that victory! Jesus, walking on the water in the midst of the storm, told the disciples to “fear not.” This is important to note because fear will strangle any effort to exercise faith! Fear is a luxury we absolutely cannot afford! Do not give in to fear; it is designed to torment us and to render us powerless in this world. Why are we trying to fight a battle that has already been won? It is the height of arrogance for us to think that what the Lord has done is not enough—that He needs our help. Just because our enemy is “huffing and puffing” doesn’t mean he is not defeated…because he is! We are expected to face the difficulty with the assurance that the Lord is with us in triumph over whatever circumstance we are currently facing and to Fear Not! Therefore, when facing the storms of life, we have to see Jesus walking in peace in the midst of that storm and refuse to fear because He is there and has already given us the victory! Look for more on this real soon! Thank you for linking to this post…Blessings! Thank you for your kind comment and Blessing! Thank you for the pingback…May God’s best be yours as you enter 2013! Can you see God in your Storm? Thank you for re-blogging this post…I sure appreciate it! God bless! I love how you say that “many Christians have believed that serving God will eliminate our storms”, however, it is in the storms that our faith is truly tested. By Nature we love it with life is going good…but it’s when life turns on us and makes things feel unbearable that our true human nature comes out. May we stand with God and see Him even in our storms. I’ve been through a few storms…and sometimes you feel like you’re losing your mind during the storm…but that’s when we’ve got to cling onto Jesus much tighter because He is the only One that is able to keep our sanity together. We all are in need of our Savior. Blessings for this post Sebastien. Great Post. Thanks for visiting my blog. The Lord is always next to us during trials. I pray we both continue to encourage others walking through difficult trials. Blessings!! Thank you and you’re welcome Cheryl! I stand with you with you in this! Thank you so much for the encouragement and boost this message is to us. He has shown me that I battle “stressing” . ..and that stressing is really for me like fear, like not trusting that God is with me and has me covered. Looking forward to hearing more! God bless you! “We tend to look at the strength of the storm rather than the strength of God…” Excellent insight! Thank you Butch! And thank you for commenting on this post! God bless! It is al about positive attitude and having a strong faith. Very good post. Thank you for reading, liking and responding to this post…nice to meet you! Blessings to you!